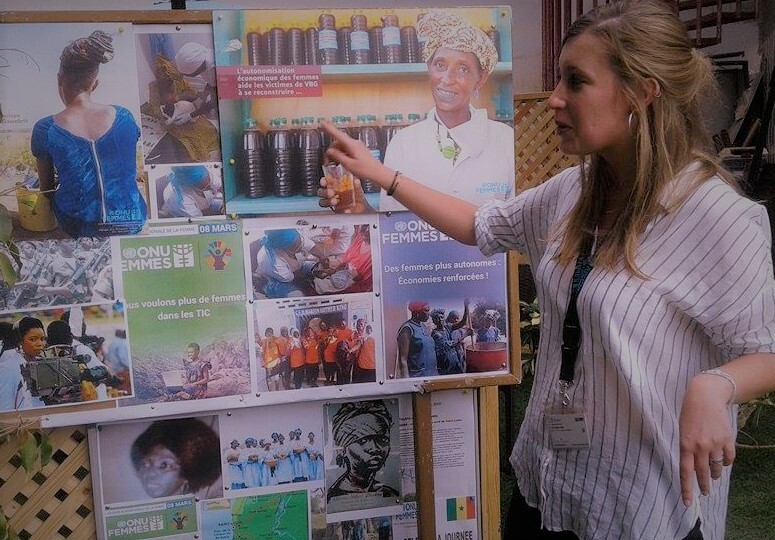 Anouk Heili (France) has been a Youth Volunteer in the United Nations’ Governance, Peace and Security Unit’s Regional Office for UN-Women West and Central Africa since October 2016. My name is Anouk and I am part of the Governance, Peace and Security team of the UN Women Regional Office in Dakar, Senegal. I am passionate about questions regarding equality between men and women and have invested myself in this cause for many years. To find myself now a UN Volunteer in Dakar, serving with UN Women, is for me an opportunity de place my convictions at the service of women's rights in West and Central Africa. My role consists largely on conducting a study on women's leadership from the perspective of their political particiation and their involvement in processes tied to peace and security in the region. It has been realised that there are greater chances for success, efficacy and sustainability of results when women are involved within peace and conflict prevention processes. Finding myself as a UN Volunteer in Dakar at the center of the Regional UN-Women's Office has been an opportunity for me to use my convictions to benefit women's rights in West and Central Africa. As part of a UN-Women project in the Sahel, I helped to organize a High Political Dialogue on the subject of women's leadership in preventing and combating violent extremism in the Sahel. The event aimed to highlight the issues related to violent extremism and terrorism, which are faced by women in the Sahel in their daily lives, as well as to see how women can be involved in policy-making on violent extremism in the Sahel. Discussions between the guests resulted in the development of the Bamako Declaration on Gender and Violent Extremism, which called for implementing a Regional Platform for Women of the Sahel. The recommendations to the G5 Sahel States also called for the full consideration of gender in national and regional strategies in combating radicalization and violent extremism, as well as the creation of frameworks for dialogue between women's organizations and religious organizations. If the Bamako Declaration were implemented, a real change for women and for all the people of the Sahel could occur. Indeed, in the Sahel, women's views are rarely taken into consideration, whereas they are in the best position to combat radicalization by the role they play in their families and communities. I am very grateful to UN-Women for giving me the opportunity to organize and participate in this political dialogue, and I am very proud to have made a small contribution to the fight for women's leadership and rights in the Sahel. This article from translated from French with the assistance of UN Onlinve Volunteer Cheryl Sternberg.